You can Zoom in or out from the View menu. Chat menu holds Mute, Delete, Archive and Mark as Unread. What's interesting in these things is that every option has a shortcut to execute it. So if you prefer to learn the shortcuts then WhatsApp for PC would be very useful. Interestingly there is a option to join beta testing from the Help tab. Here is where things differ from the web client, these apps can push you live notifications so that you don't miss your chats. It has two ways of letting the user know that there are pending notification, one is Action center integration and the other is showing the number of unread chats as Badges in Taskbar. In addition, the notification appear in the corner of your PC and clicking on it takes you directly to the chat. Pretty quick and useful. So that's how the app essentially works and it might come handy for users who keep their PC and Mac always connected to their WhatsApp. However the app doesn't run as a background service which means you have to fire it up every time you open your PC/Mac. It is also noted that the recently added bold, italic and strike through words aren't supported as of now. If these are added, then the app will provide a solid experience. Will it become Universal app ? Windows 10 Mobile is a relatively new OS as compared to Windows Phone 8.1 and only around 9% of phones are running W10M while >70% are still in WP 8.1. Releasing an UWP means terminating future updates to majority of users as UWP is compatible only with W10M. 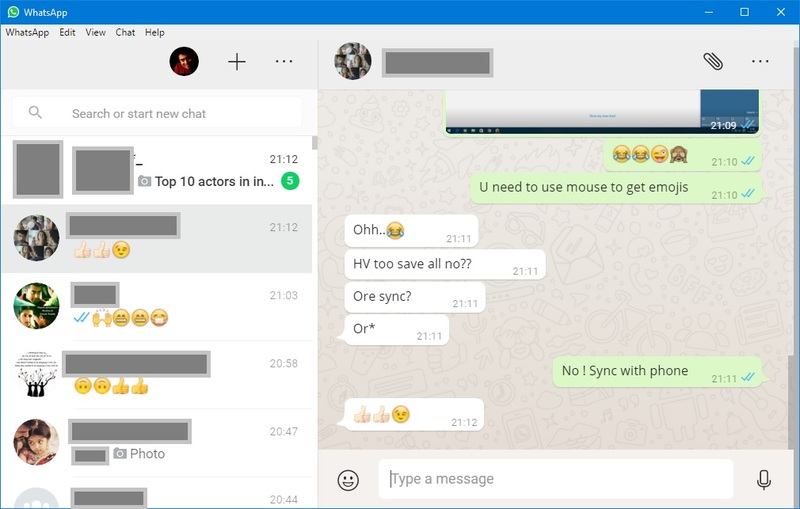 WhatsApp for PC is still not a standalone product, it depends upon your mobile for mirroring all your chats. So creating a Universal app would create a new problem, the mobile one should work as expected and the desktop one should work as an app which mirrors the mobile chats. This would result in unnecessary amount of code in a single package. If at all there will be UWA it will be released when Windows 10 gains more market in mobile and WhatsApp decides to stop supporting Windows 8.x in PC.